Host and Equitrekking's equestrian travel expert Darley Newman explores the great outdoors of Alaska on the Kenai Peninsula and around Denali National Park in Equitrekking Alaska. 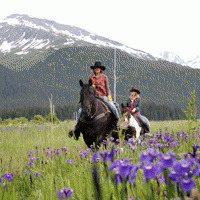 With local guides in each destination, Darley views wildlife including bald eagles and Arctic Tern on horseback in Seward. Her guide Bree takes Darley to see devastation from the 1964 Great Alaska Earthquake. Then it's time to see the Kenai Fjords National Park by boat. Darley observes whales, puffin and glaciers. Darley tries whitewater rafting on the Nenana River around Denali National Park. In Cooper Landing, Darley takes in gold rush history around the Chugach National Forest. Watch the Equitrekking video promos and purchase Equitrekking DVDs in our Store. Book an equestrian vacation at EquitrekkingTravel.com.